Biography & Genealogy: James Baldwin Dorman, Class of 1843: Born- July 23, 1823 Parents- Charles P. Dorman (VMI Board of Visitors) and Amanda Elizabeth McCue (b. 1801 m. 1820 d. 1829); Maternal Grandparents- Moses McCue and Sarah Smith. Marriage- to Mary Louisa White Newman, a widow, 1871. Matriculated at VMI from Lexington, VA. At VMI 3 years. Prewar Record: At Washington College 1839-40; Cadet Assistant Professor of Modern Foreign Languages at VMI 1841-42; taught in Gloucester County and read law; Represented Rockbridge County in Virginia House of Delegates 1848-51; chaired Committee on Military Affairs and supported African colonization and internal improvements; supported S.A. Douglas in 1860; opposed secession until Civil War broke out. Military Record: First Lieutenant, 8th Virginia Militia; served as Sergeant Major, 2d Texas Cavalry during the Mexican War; discharged Oct. 1846; appointed Major, 3d Virginia Light Artillery in May, 1861; appointed Major, Adjutant General's Department, in May of 1862; commanded camp of instruction at Dublin 1862-65; Vice Aide-de-Camp to Brigadier General D.H. Hill; Served on Adjutant General's staff of Brigadier General B.D. 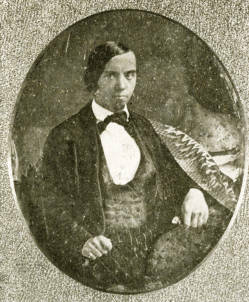 Fry (VMI Class of 1843) in May of 1865 in South Carolina, Georgia, and Florida; surrendered Augusta, Georgia on May 2, 1865 at Fry's order. Post War Career: Active in Lee Memorial Association during the 1870s; Served as Clerk of Staunton Circuit Court; lawyer; teacher. Died- Aug. 4, 1893 in Staunton, VA. For additional information about McCue (his mother's family) genealogy, see "The McCues of the Old Dominion" by John M. McCue (1912).